Jammu: A 72 year old ex-Army man died after thrashing by the three policemen, which caused protest in the area. Then government continued an order to probe and suspended a Sub-Inspector. Official said that Deputy Commissioner of Kishtwar, Baseer Ahmed Khan ordered a magisterial enquiry as well as directed SP of Kishtwar to place Sub-Inspector Madan Lal under suspension related with death of Raja Ram in Kishtwar district. Five days ago, the ex-Armyman of Bungam Tagood in chatroo belt of the district was taken to the Dadpath police for delay in de-boarding from a vehicle in which he was travelling from Kishtwar to his him. He also assaulted by a Sub-Inspector and two constables. 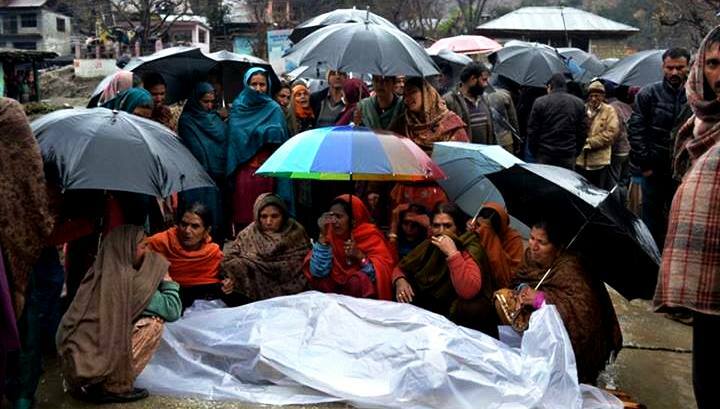 People of the area brought his dead body to Dadpath police post and by the death of Ram all were very frustrated. It held a protest, blocking vehicular movement on Kishtwar-Chatroo road for several hours demanding suspension of police officials and lodging of FIR against them, they said. Then Deputy Commissioner of Kishtwar Baseer Ahmed ordered for magisterial enquiry and directed to SP of Kishtwar to take Madan Lal under suspension. Besides it, MLA Inderwal Ghulam Mohammad Saroori at Jammu also met with the Divisional Commissioner of Jammu Shantmanu for taking necessary action against the police officials as well as registration of FIR against them for justice. Senior officers assured to take action against the erring police personals for their crime. And finally it caused the protestor called off the protest. And then administration handed over the body to the family members for last rites after autopsy of the deceased. Finally, Sub Inspector is placed under suspension by SP Kishtwar as well as also has order inquest proceedings U/S 174 Cr.PC. But the accuse police officer denied all the allegations charged against him during enquiry. He informed the senior that police has also filed “Estagasa” U/S 107 RPC against the deceased before the magistrate only for disrupting in the duty of the police officer. It’s cleared that the accuse Sub Inspector was the earlier accused of demanding money from the family of the 23 year old Tanbeer Singh, who disappeared from a marriage party almost two years ago and yet to be recovered. And Tanbeer’s family members suspect that their son might be murdered and accuses the police officer off shielding the culprits and allowed them roam freely.